To the best of my recollection, The Arizona Republic fka The Arizona Republican has endorsed a Democrat for governor only once – in my lifetime at least – Governor Janet Napolitano for reelection in 2006. And that was only because Republicans nominated Len Munsil from the Center for Arizona Policy for governor that year. A Dominionist who would impose a theocracy in Arizona was a bridge too far even for them. So it comes as no surprise that The Republic endorses Governor Doug Ducey for reelection. But of course they do. What I find curious is that there is no discussion of whether Ducey intends to complete another term as governor. There is speculation that he may run for Senator McCain’s senate seat in 2020, or take a position in the Trump administration, or if President Trump does not run for reelection in 2020, to become the next son of Arizona to be a failed candidate for president. “Arizona may be the only state in America where mothers don’t tell their children that someday they can grow up and be president.” – John McCain. [T]he most important vote [you will] cast is for governor. Here’s why that vote carries so much weight. Arizona is a state of seven million people with a $260 billion economy and about 500,000 businesses. That’s a lot of human activity that routinely encounters problems and conflicts. State government is the nerve center for many of the state’s most important issues, and choosing the chief executive – the governor – gives you the power to help define the future of your state. The governor of Arizona oversees most of the important state agencies, commissions and boards and outreach to other states. He is commander in chief of the state’s military forces. With the power to sign and veto bills, he enjoys enormous influence on the Legislature to bring bills into law and to help set a state budget, about $10 billion annually. Of all political officials in the state – federal, state or local – he enjoys the most decision-making power on Arizona issues. How he thinks and leads can shape the future of your child’s school, the money in your paycheck, the quality of your commute. Think of the governor’s office as a high hill with a panoramic view of the entire state. From there an effective governor can see the big picture and set policy to move Arizona forward. The 2018 governor’s race unfolded in the turmoil of one of the largest public employ rebellions in U.S. history. The #RedforEd movement inspired and provoked some 50,000 teachers and their supporters to march on the State Capitol in April and to demand higher pay for public-school teachers. Caught unawares, Gov. Doug Ducey tried to get in front of a teacher walk-out by proposing 20 percent pay increases for educators by 2020. Many Arizonans saw this as reactionary, because before then the governor had offered only single digit increases for teacher pay in the state budget. It is no accident that the governor’s main challenger in this race is a career educator. David Garcia is a professor in the Mary Lou Fulton Teachers College at Arizona State University and has made education the key thrust of his campaign. Garcia supported the Invest in Ed ballot measure that proposed to tax the richest 1 percent of Arizonans to increase public-school funding. But the initiative failed a legal challenge and fell off the ballot. Since then he has proposed if elected to get with the Legislature and key education stakeholders to create a new funding plan for Arizona’s schools. The state of Arizona faces looming problems on its horizon. Perhaps the most urgent is the generational drought and climate change that is depleting the Colorado River and its reservoirs and could result in severe cutbacks to Arizona’s Colorado River allotment. The Colorado supplies about 40 percent of Arizona’s water. Ducey worked to bring stakeholders together to develop a so-called “drought contingency plan” that will help set the rules for how Arizona and some of its neighboring states get water from Lake Mead when water drops to critical levels there in the coming years. Garcia would also press to make the drought contingency plan happen. Further, he would promote pricing the reflects the scarcity of water – an effective way to conserve water that both left and right acknowledge will be necessary in the future. On education, Arizona will need to find a dedicated revenue source if it is to restore education funding to pre-recession levels. Three Valley CEOs who embrace Ducey’s education plans have been exploring the possibility of a ballot initiative to raise sales taxes to create that stream. However, Ducey argues he has signed a budget that moves public schools forward and that he is committed to moving money into education as the revenues and opportunities arise. He said that spending should not be based on reaching some set number from years past, but should be set according to schools’ needs today. Garcia argues new revenues must be raised to fund the public schools adequately in the future. So, who’s best in this race? David Garcia, is a gifted, charismatic leader who inspires voters and brings with him real education chops. But he made a huge mistake in the Democratic primary. He swung wide left by adopting the same clarion call to replace ICE (U.S. Immigration and Customs Enforcement) that carried Democrat Alexandria Ocasio-Cortez in her New York congressional district. I have questioned Garcia’s unforced errors before, which played right into the hands of the Arizona GOP’s anti-immigrant bashing campaign strategy deployed in Arizona since 2004. He should have stayed laser-focused on the education crisis in Arizona, but for reasons we may never know, he stepped right into the GOP trap. He had to know it was coming, and yet he did it anyway. It is so disappointing. What works in Queens doesn’t work in Phoenix. And the pity is that Garcia had already proven his appeal to a wider electorate when he ran four years ago for state schools chief and won Republican-dominated Maricopa County. His task this time around may be impossible. 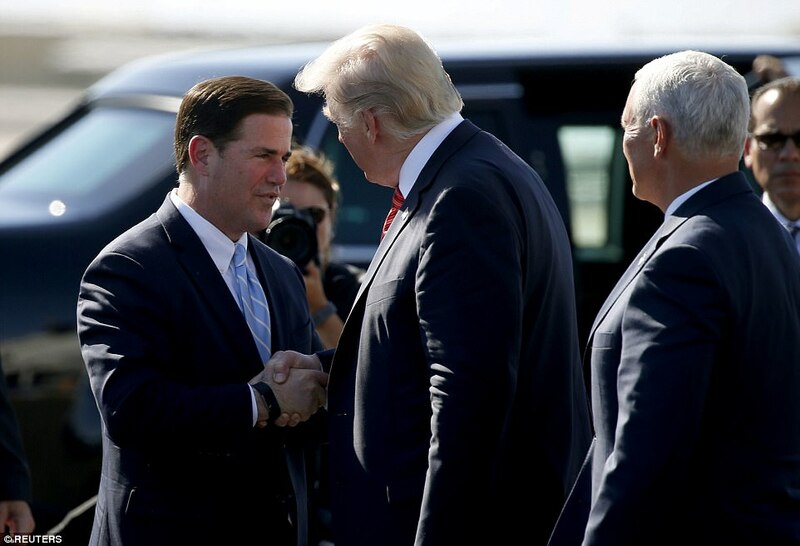 It’s unlikely any candidate this year could beat Doug Ducey, who in his own unspectacular way has managed the state with competence and now rides a wave of positive economic news. The state’s annual job growth is projected to hit 1.7 percent compared to national job growth of 0.7 percent. Maricopa County is expected to see increases of 2.1 percent annually. Doug Ducey argues that his job as governor was to pilot Arizona out of the economic crisis of the decade past. He approached it by keeping government out of the way of the free market so it could recover and prosper. He refused to raise taxes. But he also understood that a cash-poor state like Arizona could not afford drastic cuts in revenues. While he promised to cut taxes every year, he did so in nominal and responsible ways so that he did not bleed state coffers. 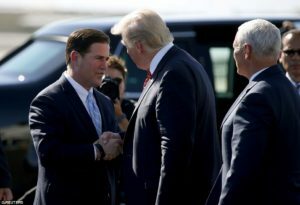 Doug Ducey has earned the confidence of the people with his steady piloting of state government. He deserves a second term. Nothing in life is inevitable. If you support David Garcia you should definitely cast your vote for him, and every other Democrat on the ballot. Next articleTrump Takes Martha McSally, Doug Ducey and other Republican Candidates through the Alt-Right Looking Glass at a rally in Mesa. Garcia has been the “Invisible Man”. How do you support someone who has done his best to avoid media attention and for an “Education Candidiate,” didn’t put out an education plan. Why did it take so long for him to air a commercial — 3 weeks before the election and after he had been hammered about ICE and the “wall”? He’s run one of the worst political campaigns I can remember when if he had developed a campaign rhetoric (e.g. Beto O’Rourke) he might have inspired voters who could have ignored the negative ads. It’s hard to support someone you don’t know and see. And if it’s the Democrat party that couldn’t finance his commercials, then shame on them. But if it’s Garcia, you shouldn’t run if you can’t afford any media exposure or defend yourself against negative ads. So why did the Arizona Daily Star endorse him then? First Republican they endorsed for governor in 20 years.